*Note: We have a video that shows the replacement process. Please watch the video to see how balance should be handled and removed while under tension. 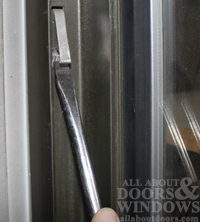 Locate and pull out take-out clips in side of window using a flat-tipped screwdriver. These do not detach from the window frame, but just pop out. There's one on either side on the top half of the window frame. 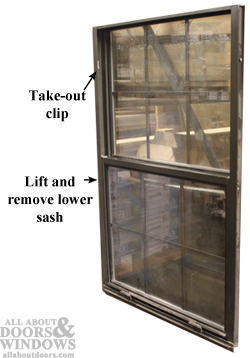 Lift lower sash up--as it slides past take-out clips, sash will disengage from balance. Swing one side of sash out and remove sash from frame. Handle gently and set aside. Channel balance is now visible in frame. Top of balance is hooked under the take-out clip. Balance is under tension. Carefully push the balance downward. The balance clip on the bottom of the balance is hooked into a hole in the window jamb. Carefully unhook clip from window jamb and set balance aside. We suggest replacing both balances at once to ensure that weight of sash is carried between two equal strength balances. What the plastic ends on your balance look like. These vary from brand to brand and window to window. You need the end of your new balance to match the original. The length of the balance (measure just the metal part, not the plastic ends). Stamp number and weight code. All metal channel balances have a code stamped into them. 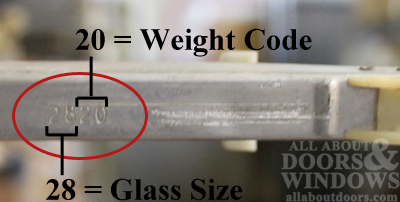 The first two numbers correspond to the glass size of your window. Following the two numbers, you'll either have one or two more numbers or a letter. This is a weight code. 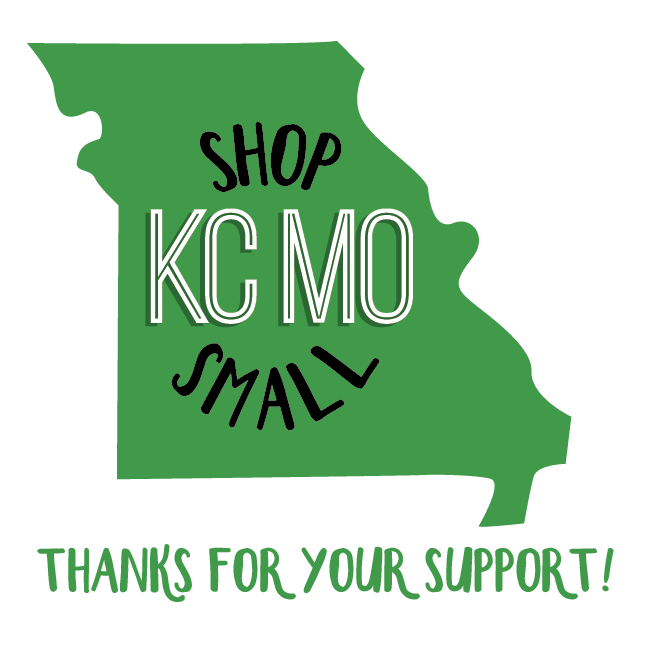 When ordering balances from us, if you know these three components, you'll be able to easily order the correct balances from our online store. To install the new balances, insert balance clip into hole, and gently pull balance down until it can be hooked into take-out clip. Once both balances are secure in place, carefully reinstall sash. Lift sash so the top of it is higher than the take-out clips. Turn one side in and then the other and slide it down in place. Push the take-out clips back in.